Before we moved I spotted this dresser at a yard sale for $10…and into the van it went. Our new house is a bit bigger than our last house…which means lots of empty space to fill on a tight budget. 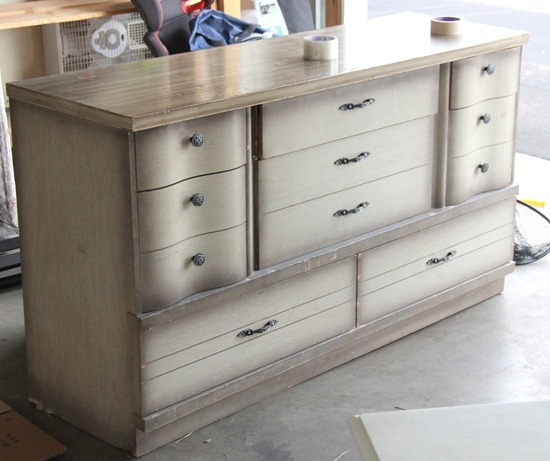 Furniture redo’s are a cheap way to get well made furniture…and it makes me happy to give new life to an old piece. The bottom needed a little trim to hide the worn edges. A couple coats of blue paint later it was ready to fill to the brim with sewing odds and ends. The knobs got a coat of black spray paint. 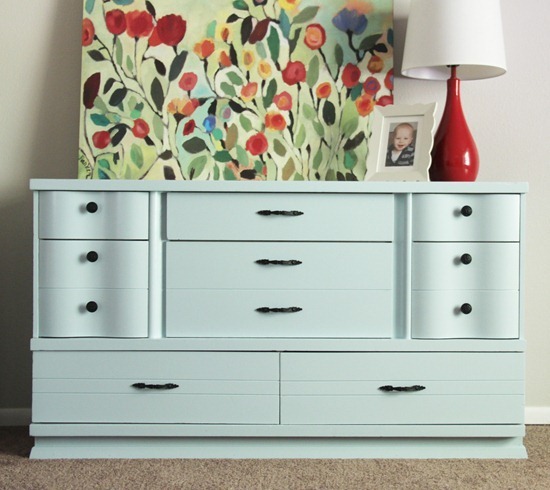 Now I love this really really really heavy dresser….and I can cram aaaa-lot of stuff in those drawers! It has great lines! Good eye and great job. You chose a wonderful color, too. looks great ! Have fun fill it ! Wow, that is really wonderful!! Yes, it will definitely be fun filling it up! now seriosuly.. $10 ?! how the hell is it possible!! it was almost free!!! :D i am sooo incredibly jelous! :D and it looks amazing in your home! Good job! It looks beautiful! wow.. good deal and a great re-do. What a great bargain!! you did a fab job refinishing it too! What a fabulous piece of furniture it has become now! Looks fantastic – brilliant reinvention. Looks great! What sort of paint did you use? Did you sand the whole thing first? Beautiful job. Love it. Have fun filling up that new home! I love it! It looks great painted & ready for its new life. Oh, that is so pretty! What a wonderful (and cheap find, and a great makeover!!! Wow, great dresser! Love the lines, the color what a deal! I love the paint color. A beautiful transformation. Great job. my parents have a set of that vintage too — I like the paint makeover. Beautiful!! What a great dresser! and good eye for seeing its potential. trim around the bottom was a nice touch. and the color is perfect. what a great find. it looks beautiful now. Beautiful painting job! Did you spray or roll on paint (primer? finish? roller or brush?) to get such wonderful finished result? Thanks for sharing. It's a beauty, enjoy! Gorgeous! Is that like a laminate finish on the original? Or is it real wood? 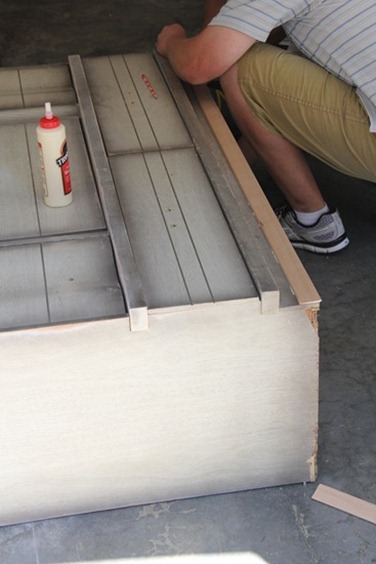 We're getting a dresser for my youngest son that belonged to my grandmother and it's that non-wood, wood look stuff that was so popular back in the day and I'd love to refinish it but not sure how. I guess prime and paint? Wow!! Love it! And only $10!! SCORE!!!!! What a wonderful project, great price, and love the color! Wow! Nice work! I never think of doing something like that. I wish I did! I see something like that at a garage sale and all I see is a used piece of furniture. I need to train my eyes to see the possibilities like you! You are wonder woman! This is so pretty! Y'all did a wonderful job. Makes me want to get on Craigslist RIGHT.NOW. I think you chose the perfect color for it. I love, love, love it!!! It's beautiful- what a great find. Oh, that came out just gorgeous ! Wow, it looks so beautiful! It turned out better than new! I caved and bought a red one from Ikea….just not the same. I love the color. It is beautiful! I'm not even going to pretend that I don't have dresser envy. ;) Might as well also admit that I'm swooning over the color you chose for it. In all seriousness, you made a great choice! Super duper cute. What a great find…that one has wonderful character to it and the color you chose is perfect. I also love your painting. don't you love what a coat of paint can do? It is very pretty especially for sewing treasures. Love it. The print behind it sets it off. You turned trash to a treasure! Great find. SO cute!! You will have to tell us what paint brand and color you used, that is the perfect blue! Oh my goodness that is gorgeous! Looked nothing before your fabulous touch, will hold so much too, what fun! Great dresser. Love that paint color. My dresser holds a lot of fabric. I labeled each drawer to keep track of things. Don`t know what I`d do without that extra space. Beautiful! Love it! Furniture redos are the best. I love the design lines of that dresser. Beautiful color too. Fill that baby up with sewing goodies! Absolutely lovely! 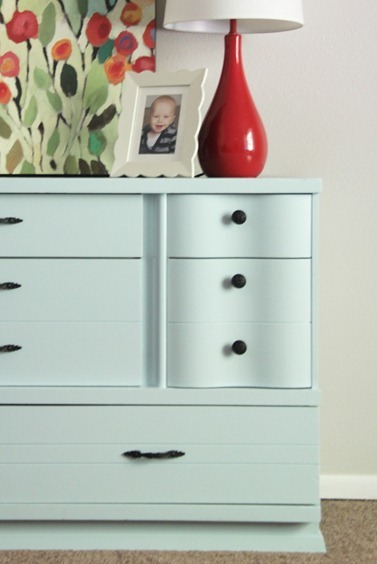 Both the dresser and the sweet blue paint! OOOH, I LOVE that dresser! What a steal. So cute! What a great idea! I wouldn't think to use a dresser to hold my sewing stuff! VERY Good job with the dresser. Just think someone might have junked it. Ever watch Saras house. She regularly shops at 2nd hand stores, paint & wow what a wonderful transformation. Wow! Came out great. It reminds me of my grandmothers dresser from the late 50's! I never would have imagined that ugly dresser could look so good, and I'm pretty good at imagining redo's! Great job, did you spray paint it? wonderful job! can i ask where you got the flower art above it? i love that too! This looks like my mom and dad's old dresser. Looks much nicer now. I swear this looks just like my parents dresser from the fifties or sixties. You did a great job. Love the way it turned out.